A very simple but tasty recipe -- just two ingredients! 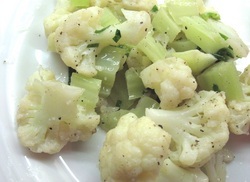 Place cauliflower florets in large bowl and drizzle with salad dressing. Cover, shake well to coat, and refrigerate for 30-60 minutes. Place in microwave-safe bowl, cover with plastic wrap, poke holes in plastic with fork and microwave at full power for about 7 minutes.